Three quarters of all vertebrates in the tropics live in or use the aboveground environment, and many of these species perform important ecosystem functions. For my dissertation research, I focused on movement behavior and habitat use for the community of animals that make use of this critical sub-habitat. Animals move in patterned and often predictable ways relative to their surrounding environment. Understanding the movement ecology of a species requires not only information on where animals move (e.g. biotelemetry), but also the environmental features around them. In tropical forests, traditional satellite-based remote sensing used characterize terrestrial habitat fail to capture the complex, three-dimensional structure of the forest canopy. Thus, our understanding of movement decisions and habitat suitability for arboreal (tree-dwelling) wildlife is quite limited. However, high-resolution Light Detection and Ranging (LiDAR) technology provides a means of capturing the vertical complexity of forest structure at the landscape scale. Using environmental variables derived from LiDAR collected by the Carnegie Airborne Observatory, I used step-selection functions to model movement behavior in three neotropical primate species. Motion-sensitive cameras or "camera traps" provide an effective, non-invasive means of surveying wildlife, detecting changes in populations, and confirming presence of rare or cryptic species. 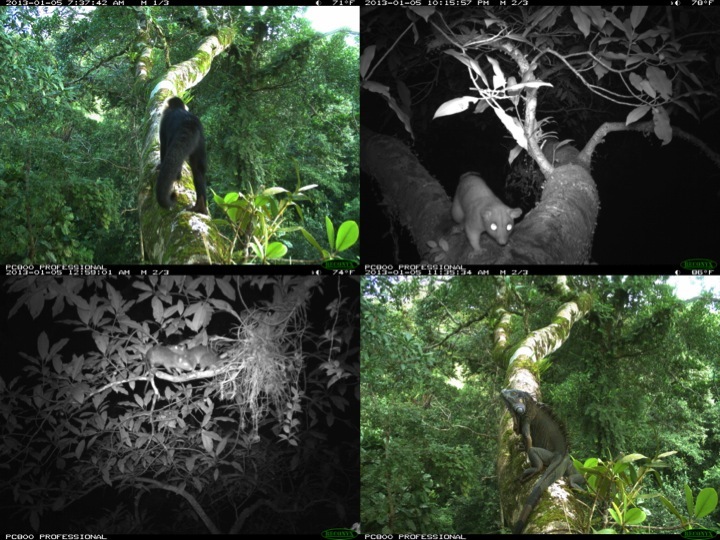 Arboreal mammals live most of their lives well out of view and are often highly nocturnal, but only a handful of studies have deployed camera traps into the forest canopy. Considering the diversity of arboreal wildlife, expanding wildlife surveys into the forest canopy provides a far more complete view of the wildlife communities in these forests.